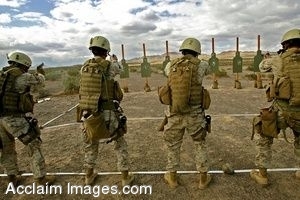 Description: Clip art photograph of marines with the Personal Security Detachment for the Camp Pendleton, Calif.-based 1st Reconnaissance Battalion engage targets with their pistols May 24 in the Mojave desert. 1st Recon is currently working through the Marine Corps "Mojave Viper" training package to prepare for their upcoming deployment. Clipart photograph by Department of Defense Public Domain.